Classic style and British manufacturing are both experiencing a boom in demand-driven by a desire among consumers for authentic, quality products. Britain is uniquely placed to benefit from this resurgence, given the number of heritage companies still producing at the top of their game. From the world-famous Barbour in South Shields in the north of England to John Lobb in London, many of these fine businesses remain in family ownership, protective of their traditions and justifiably proud of their products. Many are the bearers of warrants from the British Royal family and all are over 100 years old. Horst Friedrichs explores the historic places where these British brands have become some of the strongest in the world: Johnston's of Elgin in the north of Scotland, Corgi socks in southern Wales and John Smedley in Derbyshire. By highlighting the stories of these legendary brands-both new and old, grand and humble- Friedrichs and Crompton show how relevant these companies and their traditional production techniques still are. 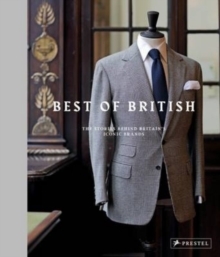 A Very British Heritage is a must-read for anyone that appreciates well-crafted products and timeless style.